Economic Development 12 Edition For courses on economic development A complete, balanced introduction to the theory, issues, and latest research. Economic Development, Twelfth Edition—the leading textbook in this field—provides students with a complete and balanced introduction to the requisite theory, driving policy issues, and latest research. 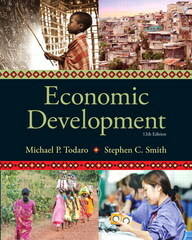 Todaro and Smith take a policy-oriented approach, presenting economic theory in the context of critical policy debates and country-specific case studies so you can see how theory relates to the problems and prospects of developing countries. Teaching and Learning Experiences This program presents a better teaching and learning experience–for you and your students. Use the text’s Hallmark Approach to presenting engaging information: Shaped by the authors’ personalities, this approach is backed up with extensive research and travel to provide the best data possible. Teach with strong pedagogy tools: The text reinforces central key concepts by presenting a clear learning path for students. Give students a real-world global perspective: Students are able togain a unique perspective about world issues from two authors who strive to address different sides to problems.